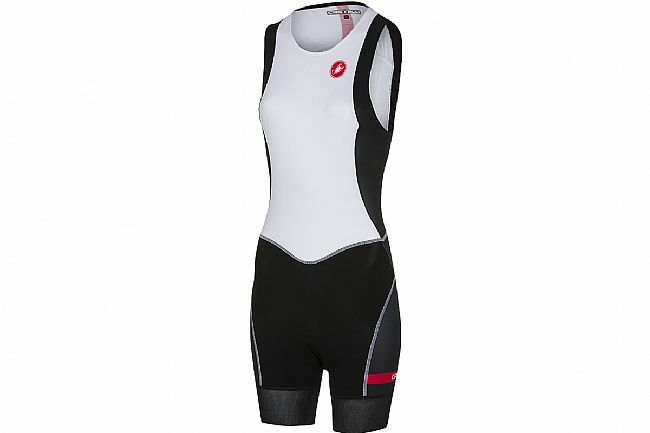 Castelli's Women's Short Distance Race Suit is designed for sprint and Olympic distance racing, especially with non-wetsuit swims. Water-repellent fabrics like Instradry Speed fabric, a second-skin fit, and stripped-down construction reduce drag and deliver fast swim times. Two Aero pockets at the hip offer a place to keep nutrition without weighing you down. The women's specific Kiss Tri chamois eliminates excess material while still offering necessary on-bike support. SpeedFreak Dry water-repellent upper fabric. Instadry Speed fabric on short.